Crane Prairie Reservoir, situated in the Cascade Mountains southwest of Bend, is famous for its trophy-size rainbow trout and beautiful scenery. Located about 30 miles southwest of Bend, three different forest service roads provide access to Crane Prairie Reservoir. 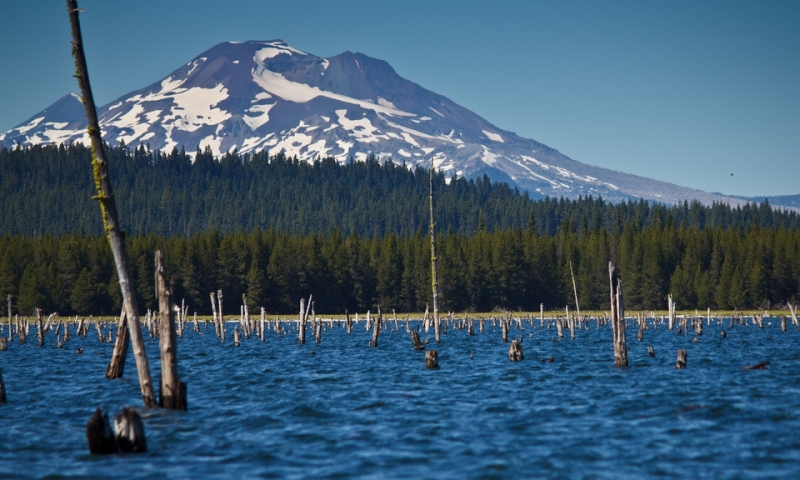 One of the most popular trout fishing lakes in Oregon. Home of trophy-size rainbow trout known as “crane bows”. Crane Prairie Reservoir is a Wildlife Management Area. Located in the beautiful Deschutes National Forest not far from Bend, Crane Prairie Reservoir is one of the state’s most popular trout fishing lakes. This mountain reservoir was developed back in 1922. It has over 4,900 surface acres of water and 24 miles of scenic shoreline. The area provides a variety of recreational opportunities for those who visit, including camping and boating. Nature lovers are drawn to the array of splendid wildlife and birds that inhabit this Wildlife Management area. Crane Prairie Reservoir Oregon is located approximately 30 miles southwest of Bend. Cascade Lakes Highway (Forest Service Road 46) is one of the most scenic routes to the lake, but you can also take FSR 40 or FSR 42 to get there. Deschutes National Forest, 1001 SW Emkay Drive, Bend, OR 97702 Phone: 541-383-5300. Visit the website here. Fishing – Although known for its “crane bows” – a name given to the rainbow trout produced by this popular fishery - avid anglers can also catch Kokanee salmon, brook trout, black crappie, largemouth bass, and mountain whitefish in the reservoir. June through August is the best time to fish here. The reservoir has two float tube launch points, and several boat launches. Camping – Several campgrounds are near the lake for those who enjoy camping out under the stars during the warm summer months. Bird Watching – Bring your binoculars to get close-up views of osprey, Canadian geese, sandhill cranes, and majestic bald eagles, as well as a variety of other birds that can be found here. Crane Prairie Reservoir’s elevation is 4, 445 feet, and its maximum depth ranges from 16 to 20 feet. The reservoir covers almost 5 square miles. Anglers are encouraged catch as many bluegill and crappie as they can by the ODFW, as they are a potential threat to the trout fishery. The largest rainbow trout caught to date at Crane Prairie weighed more than 19 pounds.